Dues are $15.00 per person/family. The membership year starts May 1 and ends April 30. Membership entitles members to FCGS Newsletter, published semi-annually, May and November. Anyone joining during the year will receive all Newsletters for that year. Please enclose a self addressed stamped envelope for the return of your membership card. 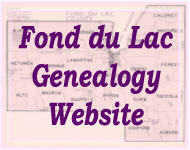 Cemeteries - Fond du Lac County has 21 townships with 102 known cemeteries. To date, we have 80 cemeteries indexed, including Rienzi, Calvary, Estabrook, Hillside (Ripon), Garden of the Cross, St. James and Woodlawn (all in Ripon), Forest Mound (Waupun), Union & St. Matthews (Campbellsport), St. Johns (New Fane), St. Charles Cemetery (Taycheedah). Various cemetery inscription books, and vital records are available for sale from the society. View the order form for a listing of material available for sale. Print out the form and mail to the society, to place an order.